#Packers FB Aaron Ripkowski, who took a hellacious shot from Anthony Hitchens to start the game, just ran through Hitchens there. #Packers score but LT Bakhtiari is down injured, rolled onto his back and is now crouched in pain. Now on his back again. David Bakhtiari got rolled into on Montgomery's TD. #Packers LT David Bakhtiari, a second-team All-Pro, is still down after getting his knee rolled up. He's vital to this offense. Bakhtiari got rolled up on by Cowboys LB Sean Lee. His body clattered into the lower legs of Bakhtiari, who is limping off the field. David Bakhtiari is up, and he JOGS off to the sideline without help. Looks like #Packers dodged a huge blow there. #Packers OT David Bakhtiari jogged off after receiving medical attention on field. Dallas defender rolled into right knee on TD run. 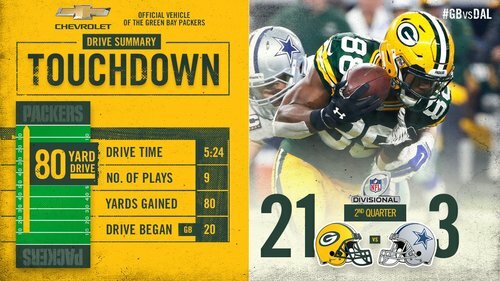 Ty Montgomery, the Dallas kid who dreamed of playing RB at Cowboys Stadium, has two rushing TDs today to give #Packers 21-3 lead. Second TD run by Montgomery makes it 21-3 with 7:37 left in the second quarter. This is getting ugly. Rodgers with 191 yards already. Another #Packers scoring drive capped off by another @TyMontgomery2 touchdown run! Bakhtiari is talking to Spriggs on the sideline. Now he's off to the locker room. Hey Jerry, can Tony Romo play defense? 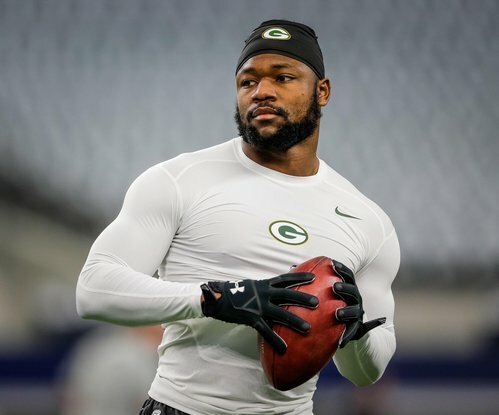 Looks like Spriggs will have to finish the half for the Packers. Morgan Burnett is still out. Brice still at safety for Burnett. #Packers say OT David Bakhtiari has knee injury and is questionable to return. #Packers LT David Bakhtiari (knee) is questionable to return. Packers say Bakhtiari (knee) return questionable. #Packers LT David Bakhtiari is questionable to return with a knee injury. Flags down at the Cowboys huddle again. Focused & ready to go from the start. Well, that escalated quickly. 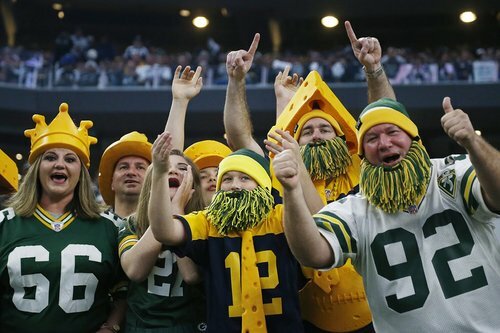 #Packers can't afford to let their foot off the gas against this Cowboys offense. Strong answer by the Cowboys. A 21-yard pass to Bryant followed by a 40-yard pass to Bryant for the touchdown. #Packers lead 21-10.